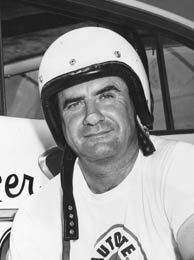 Elzie Wylie Baker Sr. (March 4, 1919 – April 14, 2002), better known as Buck Baker, was an American stock car racer. Born in Richburg, South Carolina, Baker began his NASCAR career in 1949 and won his first race three years later at Columbia Speedway. Twenty-seven years later, Baker retired after the 1976 National 500. During his NASCAR Strictly Stock (now Monster Energy NASCAR Cup Series) career, Baker won two championships, 46 races and 45 pole positions, as well as recorded 372 top-tens. In 1957, he became the first driver to win two consecutive championships in the series.